Governor Bill Ritter has proclaimed the week of October 19th through October 25th as Winter Weather Preparedness Week in Colorado. 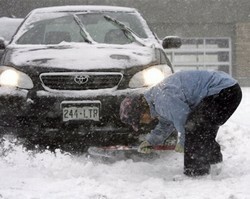 Winter weather in Colorado can be an inconvenience but more than that it can be deadly. Emergency preparedness for major winter storms – as well as for other types of severe weather – is an important part of living in a state where conditions can change wildly from one moment to the next. To help raise awareness of the need to be prepared for these occassions, Governor Ritter has proclaimed the week of October 19th to October 25th Winter Weather Preparedness Week in Colorado. The National Weather Service will be issuing Public Information Statements each day this week to highlight the dangers of winter weather and how best to be prepared. ThorntonWeather.com will be posting these notices here in our news section to help you be prepared. Please take the time to read and heed these messages – your life could depend on it. Governor Bill Ritter has proclaimed the week of October 19th through October 25th as winter weather preparedness week in Colorado. This is an excellent time for all individuals… families… businesses… schools… and media outlets to review their winter storm preparedness plans. It is especially important for all new arrivals to the state to become familiar with the national weather service watch and warning definitions as well as winter safety procedures. Heavy snow in the mountains is important for the ski industry and for filling up reservoirs. However…winter storms also cause travel problems and can result in life threatening conditions. Anyone who needs information on winter storms in Colorado should contact their nearest National Weather Service office. This entry was posted on Sunday, October 19th, 2008 at 3:36pm MDT and is filed under Colorado Weather, Severe Weather, Thornton Weather. You can follow any responses to this entry through the RSS 2.0 feed. You can skip to the end and leave a response. Pinging is currently not allowed. This is good info for sure. Folks often times know what to prepare for, let alone how to. I am looking forward to reading the series.